The information provided here is for versions of Dynamics 365 prior to Dynamics 365 (online), version 9.0. For the latest documentation, see Key preparation and configuration tasks. This topic, which is intended for administrators and business users of Microsoft Dynamics 365, describes common configuration settings and tasks that can help you keep your organization optimized so that you can focus on what’s important. It’s designed to improve your overall experience with Microsoft Dynamics 365, even before your business begins to use it. Microsoft Dynamics 365 is a web-based application and uses web browsers, such as Internet Explorer, as the user interface to view, add, or edit information that you’ve stored in the Dynamics 365 database. Make the following common Internet Explorer configuration settings to optimize your Dynamics 365 experience. To make sure that Internet files for Microsoft Dynamics 365 are not being deleted, increase the disk space for temporary Internet files. Open Internet Explorer, and on the Tools menu, click or tap Internet Options. On the General tab, in the Browsing history section, click or tap Settings. Set the Disk space to use field to 350. Click or tap OK, and then click or tap OK again. To optimize your Dynamics 365 experience, we recommend that you do not select the option to delete the browsing history when you exit from your browser. If you select this option, it deletes everything marked in your Browsing history settings, such as temporary Internet files, cookies, and history (by default, the check boxes for these options are selected). Deleting your temporary Internet files causes Internet Explorer to cache the files again, and deleting cookies signs you out of Dynamics 365. Click or tap the General tab, and in the Browsing history section, make sure that the Delete browsing history on exit check box is cleared. Microsoft Dynamics 365 occasionally uses pop-up windows. Your browser may be blocking these windows because of the pop-up blocker settings. You must configure the pop-up blocker settings to allow pop-up windows for the Dynamics 365 websites. Go to Control Panel > System and Security > Power Options. 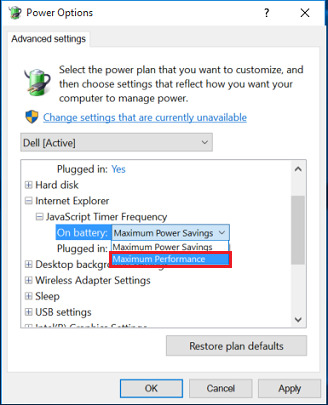 For your active power plan, click Change plan settings > Change advanced power settings. Every time you visit a website, Internet Explorer stores the website data as cache, and uses it when you open the website again. This increases your browsing speed. Internet Explorer can store up to a maximum of 10 MB cache data. If your users visit a particular website often, it will store a lot of content on their system, and it may reach the maximum limit of data storage. To avoid this, you may want to increase the data storage limit for your browser. Here are two ways you can increase the data storage limit for Internet Explorer. On your keyboard, press the Windows key + R.
In the Run dialog box, type gpedit.msc, and click OK.
Local Group Policy Editor opens. Navigate to Computer Configuration > Administrative Templates > Windows Components > Internet Explorer > Internet Control Panel > General Page > Browsing History. In the right pane, double-click the setting Set default storage limits for websites. In the Set default storage limits for websites dialog box, click Enabled, and then in the Options section, in the Set default storage limit for websites field, add the required limit. Close Local Group Policy Editor, and restart the computer. In the Run dialog box, type regedit, and click OK.
Navigate to the key: HKEY_LOCAL_MACHINE\SOFTWARE\Policies\Microsoft. Create a subkey Internet Explorer inside Microsoft. Right-click Microsoft, and then click New > Key. Type Internet Explorer as the name of the subkey. Similarly, create a subkey BrowserStorage in the newly created subkey Internet Explorer. Click the BrowserStorage subkey, and in the right pane, right-click, and then click New > DWORD Value. Type DeafultDomainCacheLimitInMB as the name. Double-click the DWORD item you just created. In the Edit DWORD Value dialog box, select Decimal as Base, and then enter the required storage limit in MB, and click OK.
Close Registry Editor, and restart the computer. You can configure the following settings to optimize the performance of Dynamics 365 for Outlook. Use Windows Update to check for updates to Dynamics 365 for Outlook. Typically, these updates help improve performance or ensure greater stability. Enabling automatic synchronization allows Dynamics 365 for Outlook to systematically synchronize the data from the Microsoft Dynamics 365 data center. This ensures that your local data is regularly updated. Therefore, when you go offline, the data required to synchronize locally is a manageable size. Open Outlook that has Dynamics 365 for Outlook installed. On the File tab, click or tap Dynamics 365, and then click or tap Options. On the Synchronization tab, in the Schedule automatic synchronization with Outlook section, make sure that the Synchronize the Dynamics 365 items in my Outlook folders every __ minutes check box is selected. For offline synchronization, on the Local Data tab, in the Select how often to update local data section, make sure that the Update local data every __ minutes check box is selected. To make sure that your calendar appointments don’t disappear from Dynamics 365 after you begin to track these in Dynamics 365 for Outlook, make sure that your user email address on the respective user record matches your email address being used for Outlook. The email address may differ from your Microsoft account. It depends on the email addresses you’re using in Outlook and on your Dynamics 365 user record. Network connections are established based on the order that the device is listed in the Adapters and Bindings tab of the Network Connections window. For example, if you have enabled a Local Area Network (LAN) and a wireless connection, the order of how a device is connected to the Internet is based on its order in the Adapter and Bindings list. If the LAN connection is higher in the list, most network connections will be established by using the LAN adapter instead of the wireless adapter. To make sure that your network connections are optimized, organize the connections according to your network administrator's recommendation. Right-click Start and then click or tap Run. Type: control netconnections and then click or tap OK.
Click or tap Organize > Layout > and verify Menu bar is checked. Click or tap Advanced > Advanced Settings. Click or tap the Adapters and Bindings tab, and then, under Connections, click or tap the connection that you want to move in the list, click or tap the up or down arrow button, and then click or tap OK. Depending on your antivirus or malware application settings, virus scanning can block certain files, making them inaccessible to other applications and causing an adverse effect on Microsoft Dynamics 365 performance. If you use other antivirus software, make sure that the URL of the Dynamics 365 website is included in the trusted zone for the virus scanning, and disable on-access scanning for the Dynamics 365 website. For more information, see the specific antivirus application documentation. Microsoft occasionally sends out email messages to Microsoft Dynamics 365 users or administrators. These messages provide information about how to use Dynamics 365 and also contain important billing or upgrade details. **crmonl@microsoft.com**. This email alias sends information about updates to the service. **billing@microsoft.com**. This email alias sends information about Dynamics 365 billing. **msonlineservicesteam@microsoftonline.com**. This email alias sends informational email messages when you sign up for Dynamics 365. We want you and your organization to take full advantage of the extensive content and materials available that can help your business be more successful while you are using Microsoft Dynamics 365. For a list of available resources, including training materials and information about how to support your online organization, see the CRM Help Center. If you cannot find the answers you need in the resources discussed earlier, you can submit a technical support request to Microsoft Customer Support Services. Technical support incidents provide reactive support that focuses on a specific problem, error message, or functionality that is not working as intended. For assistance information, see Support. What part of the application are you having issues with? For example, installation issues with Dynamics 365 for Outlook. What is the exact error or problem that you are experiencing? Provide detailed information, including the exact error message that you are seeing. Include a screen capture if you can. What were you doing in Microsoft Dynamics 365 when the error occurred? Provide the exact steps that you are performing to reproduce the error. This lets the Support team better analyze why you may be experiencing it. What are the details of the environment you are experiencing the issue on? Provide the version of the operating system, browser, and if applicable, the version of Microsoft Office on the computers where the issue is occurring. Does the issue affect all users or a certain type of Microsoft Dynamics 365 security role or only certain users? When possible, provide log files (if you know how to find them). This applies to applications such as Dynamics 365 for Outlook or Microsoft Dynamics CRM Email Router. The following table lists the location of the log or trace files for these applications.